Have you ever wanted to play as Luigi in the original Super Mario Bros.? No? Well too bad here it is anyways. This mod changes up the physics to match Luigi’s physics from The Lost Levels, changes text, changes pallets, and include custom made Luigi sprites by your’s truly. 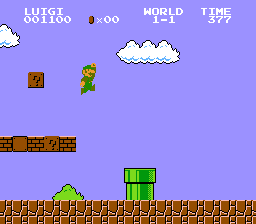 I love and hate Luigi's physics in the rom, since I can skip most underground levels by jUmPiNg To ThE rOoF eFfOrTlEsSy, but then I remember I'm playing SMB1 and that's exactly how it would have been if his personality traits were more than "Mario's clone brother" at the time the game was made. Great job!